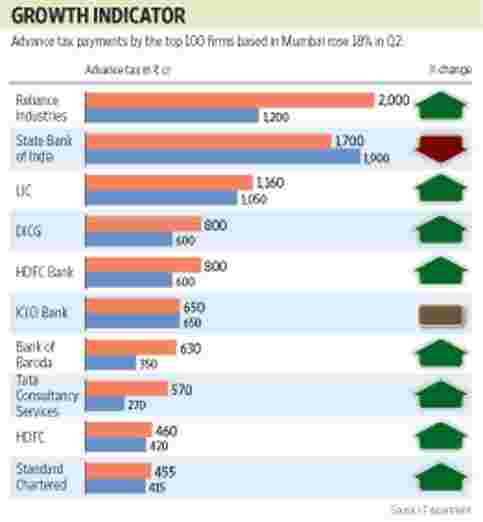 Mumbai: Advance tax payments made by the top 100 companies based in the country’s financial capital Mumbai rose 18% for the quarter ending September (Q2), indicating a likely slowdown in profit growth at Indian companies. This is well short of the 31% increase in direct tax projected by the government for the whole year, and income-tax (I-T) officials now aren’t sure if they will be able to meet this year’s target of ₹ 5.85 trillion. In the first five months of this fiscal, direct tax collections totalled ₹ 1.54 trillion, up 25.9% from a year ago. “Advance tax numbers cannot be used as a leading indicator for the economy because of complications such as internal company dynamics, inflation, tax rates, tax bases," said Ritika Mankar, an economist at Ambit Capital Pvt. Ltd. However, “we believe that the economy is slowing down and forecast 7.1% gross domestic product growth for fiscal 2012". In this instance, the advance tax numbers support other indicators, including the Index of Industrial Production growth slowing to 3.3% in July and the economy growing just 7.7% in the first quarter versus a year-ago 8.8%. Economists are scaling down growth projections for the rest of the year amid interest rate increases to rein in inflation. The Asian Development Bank on Wednesday lowered India’s growth estimate to 7.9% from 8.2% earlier. “At this stage, we are not sure if we will meet the direct tax targets," said an official from the I-T department who didn’t want to be named. Apart from the slowdown, the I-T department also has been clearing pending refunds to companies and individuals. Net direct tax collection (including refunds) for the first quarter has actually dropped 3.3% from a year ago. Some view the 18% tax growth number with cautious optimism. “While there is certainly a slowdown, corporate earnings are estimated to grow at 16% this year. These numbers support that," said Gopal Agrawal, who manages funds worth ₹ 425 crore at Mirae Asset Global Investments (India) Pvt. Ltd.
Brokerages such as Citigroup Global Markets Inc. see “earnings growth remaining decent at 18-19% (for this calendar year)…adjusting for the increase in interest rates". The Reserve Bank of India has increased interest rates 11 times since March 2010 and is expected to do so on Friday as well, although some analysts say jitters on the economy could lead to a pause. Another increase could put further pressure on demand and earnings growth for Indian firms, which are already suffering because of high input costs and a squeeze on margins. “We think FY12 consensus earnings have further downside from here," Prabhat Awasthi, Nipun Prem and Sanjay Kadam of Nomura Financial Advisory and Securities (India) Pvt. Ltd said in a 19 August review of June quarter earnings. “Street expectations of economic growth are being downgraded for this year and next, and the analyst community would likely continue to cut earnings estimates in tandem." To be sure, the tax collections are not uniformly good or bad across companies and sectors, except for oil marketing companies, which saw a decline in levies paid. Reliance Industries Ltd, India’s most valuable company, was the largest taxpayer. It paid ₹ 2,000 crore as advance tax, up 66.67% from a year ago. State Bank of India, the country’s largest lender, paid ₹ 1,700 crore, about 10% less than a year ago, yet another indication of its continuing woes. On the other hand, peers such as HDFC Bank Ltd and Bank of Baroda showed growth in tax numbers. HDFC Bank paid ₹ 800 crore, 33% more than a year ago, while Bank of Baroda paid ₹ 630 crore, 80% more. Others such as ICICI Bank Ltd and Bank of India showed no growth in levies paid. Life Insurance Corporation of India was the third largest taxpayer in the Mumbai circle at ₹ 1,160 crore, up 10% from a year ago. Of the 20 members of the National Stock Exchange’s Nifty index for which advance tax figures are available, 14 have paid more tax this year.